The idea of wild lands refer to those atmospheres where the unique noble lady and mistress is the nature. Alicudi is the concretisation of the idea of wild nature, a paradise between sky and earth, and a small village, Alicudi Porto, situated on the eastern coast of the island, an area where other beaches are situated. 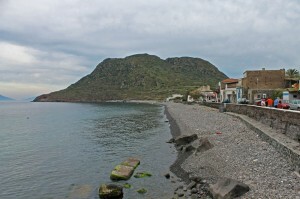 The beach of Alicudi Porto is mostly made up of boulders. The mentioned site is not hard to reach on foot; its waters are crystalline and the background of this wonderful natural sight is constituted by colourful fishermen’s boats of the island and of typical Aeolian houses. It is important to specify that the beaches of Alicudi are few and not all of them are reachable on foot. The island is amazing and can be visited by boat; it is possible to admire not only clear and crystalline waters, but also to enjoy the island’s views. One of the most fascinating views to be enjoyed from the boat is the landscape of high rocky coasts, typical of the Alicudi island. Not far away from Alicudi Port, reachable by boat, there is the beach of Bazzina. This small glimpse of earth takes name from the namesake village. It is about a proper glimpse, a little but charming creek bathed by not very deep but crystalline waters which bathe the shore mostly made of pebbles. The seabed of this area permits those keen on scuba diving, wonderful diving without breathing apparatus.